A clogged condensate drain line is one of the most common reasons homeowners need to call in for professional repair for their AC system. However, many homeowners don’t realize the problem is usually avoidable with regular care and DIY AC maintenance. If your condensate drain line is clogged, you can likely remove the clog yourself. Read our easy how-to guide below. Need AC Maintenance or Service in Gainesville? You can prevent a clogged AC drain by performing routine cleaning. By pouring a ¼ cup of vinegar into your AC’s drain line, you will kill any mold, algae, mildew, and other forms of bacteria or fungi, preventing it from forming a buildup and causing a clog. Repeat this monthly for the best results. Here’s a step-by-step guide on how to clean your drain line with vinegar and keep everything operating at peak performance. Step 1. Turn off your air conditioner. Turn the system off at the thermostat as well as at the breaker. Step 2. Locate your condensate drain line. Your drain line is a PVC pipe located near your outdoor unit and is attached to the wall of your house. Step 3. Identify the access point on the drain line. Most drain lines will have a T-shaped vent tee with a cover or cap. Remove the cap at the top of the drain and inspect for blockage. Step 4. Flush with distilled vinegar. Add ¼ cup of distilled vinegar to the drain line through the opening where the cap was removed. It’s recommended you use regular distilled white vinegar, as the increased acidity boosts its cleaning properties. If you find the smell of vinegar foul, you can also use peroxide or hot water and a dash of dish soap. Step 5. Let the solution sit for 30 minutes. Flush the pipe out with water to ensure everything is flowing freely and operating as it should. Step 6. Repeat each month. Kill any harmful bacteria or buildup and make sure your system continues to operate at peak performance by cleaning your drain line every 30 days. Because condensation collects in your air conditioner’s drain line, it provides the perfect breeding grounds for mold and algae to thrive. Over time, sludge and buildup form in your condensate drain line. This debris can include mold and mildew, algae, bacteria, fungus and even small plants. Once enough buildup accrues, the blockage will become too large and create a clog in the line, causing water to back up into the AC drain pan. What Does My AC Condensate Drain Line Do? The condensate drain line connected to your AC unit plays a vital role in the effective operation of your entire system. 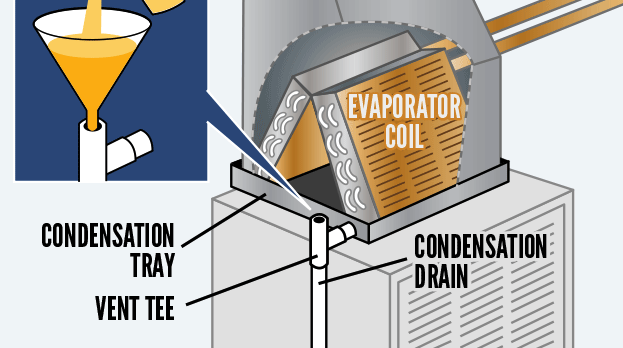 Ultimately, your condensate line is responsible for removing the condensation that’s produced by the evaporator coil, draining it from the air handler to the outside of your house. If you’ve gone through the above steps and are still having issues with the performance of your air conditioning system, the professionals at A+ Air Conditioning and Refrigeration in Gainesville, Florida are here to help. For over 18 years, we have provided unrivaled HVAC service to residents of the North Central Florida counties of Alachua, Marion, Levy, Dixie, Gilchrist, Columbia, Union, Bradford, Clay and Putnam. Contact us today to schedule service online or call us now at (352) 374-4988.